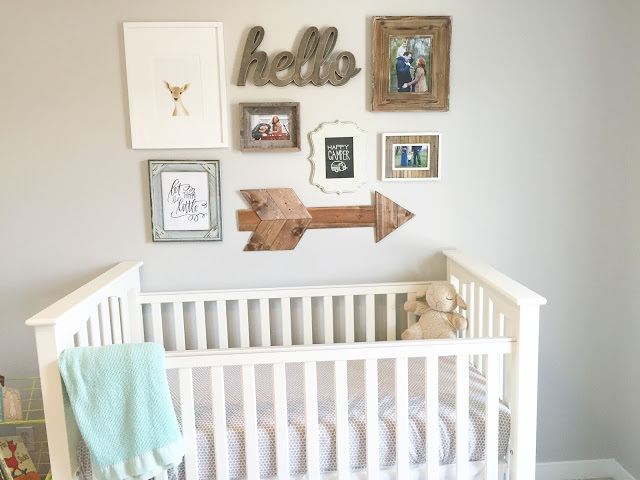 Finally, baby #2’s nursery is (mostly) done! 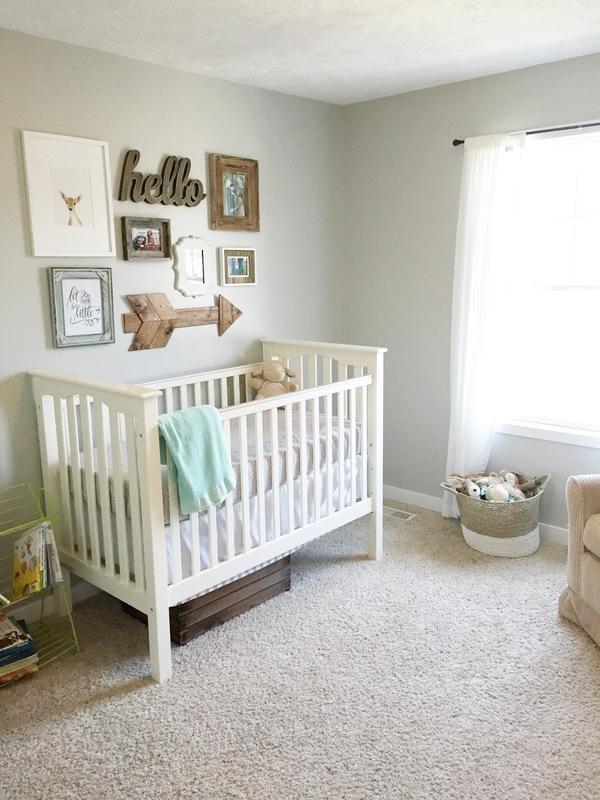 Once we know if baby is a he or a she, we will add in some pink or blue accent colors and probably more bedding and re-vamp the curtains. But for now, it’s the perfect bright space for our little one. If only he or she would make his or her appearance soon! The view from the door. This room is pretty small so we wanted to keep it simple. 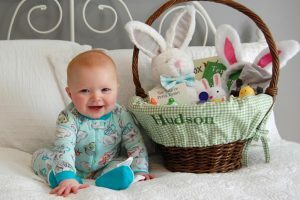 Funny story, if you ask Hudson what the baby’s name is, he says it’s “Hello”. 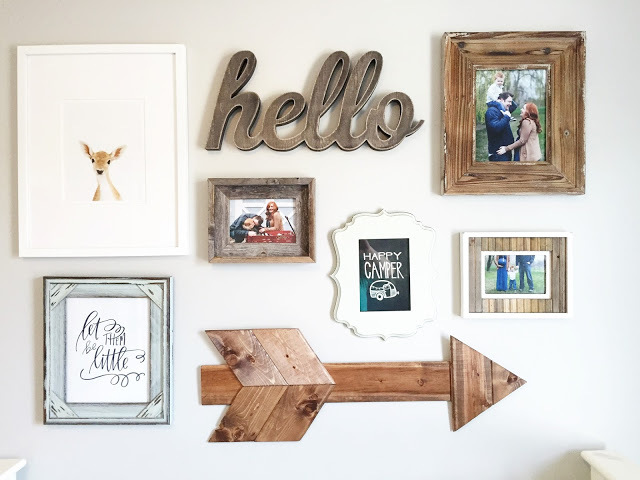 He’s been pretty consistent that baby is named “Hello”….so when I saw the wooden hello at Hobby Lobby I just had to buy it! For now the frames have photos from our maternity photo shoot. We’ll replace them with baby photos and probably some personalized art once baby is here. So in love with how this wall turned out! 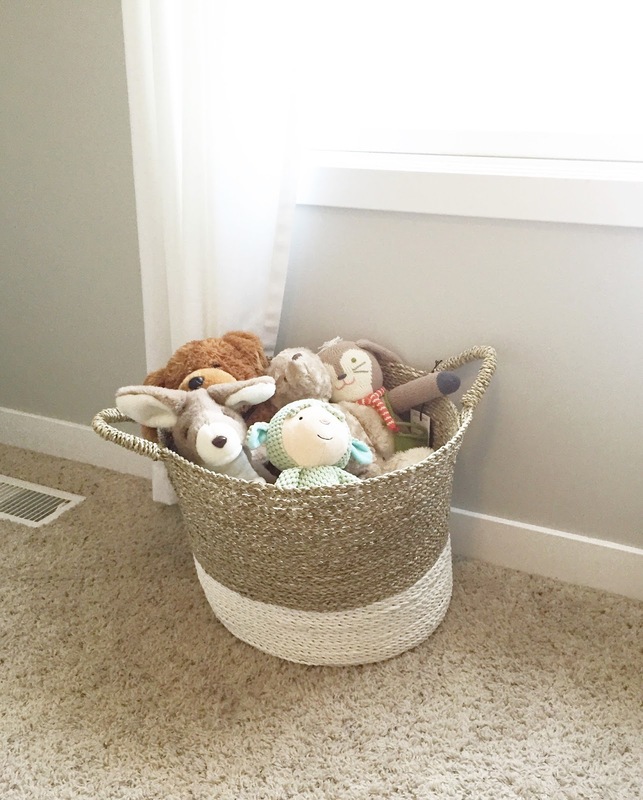 Basket of friends waiting to be played with! Come on baby! We are ready for you! 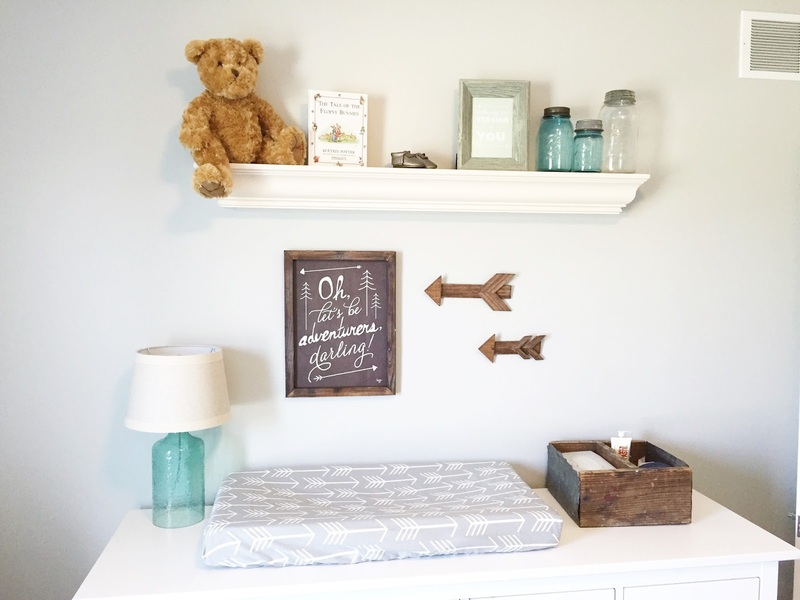 Happy Camper Print: Garvin & Co.
What a fabulous nursery! I love the palette you chose and the arrows are so fun! Love it 🙂 the wooden accents and mason jars are my favorite! xo Chelsea play. wash. rinse. repeat. It's beautiful! Now come on, baby!!! It's beautiful! Now all you need is a little one to occupy it! Nesting has done you gooood girl! It looks amazing! 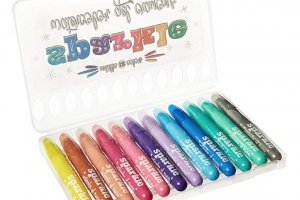 So bright and perfect for that little bundle you'll be bringing home soon! It turned out beautifully Julie! Love love love! 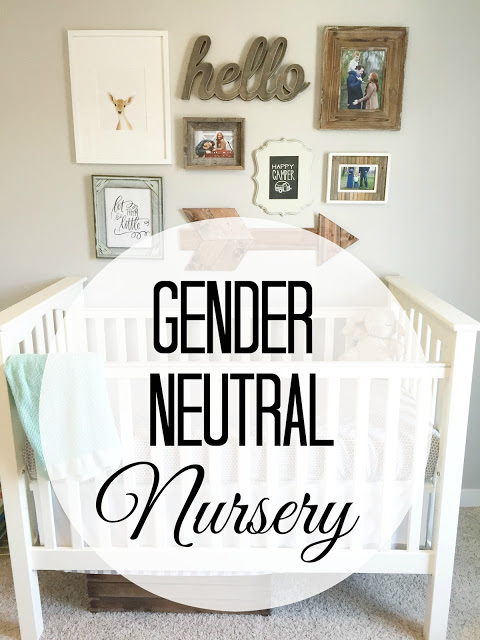 this is for sure one of my favorite neutral nursery I have seen! The "Hello" and arrow totally tie everything together!!! Congrats on this exciting time! 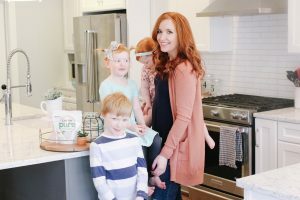 I can't wait to see if you have a little stud or a cutie pie!! I LOVE this!!! It's gorgeous! And so welcoming for baby! 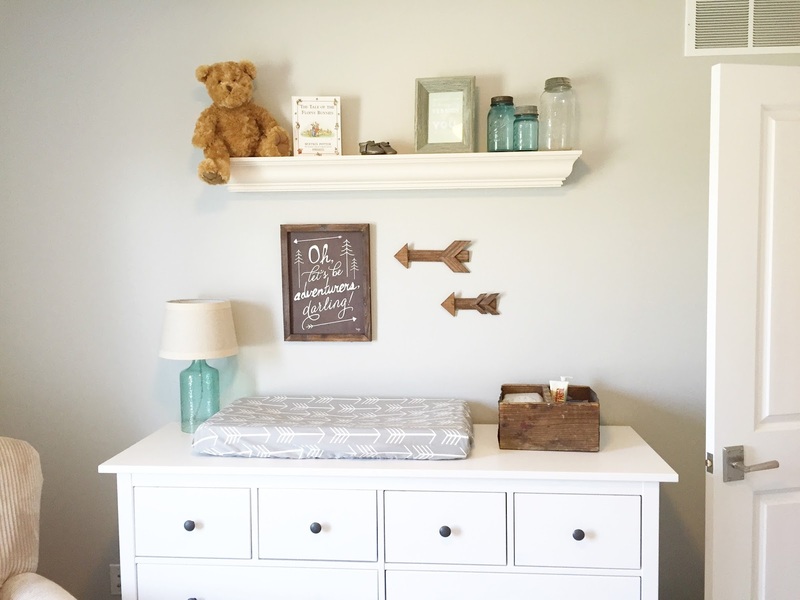 I love how much your mom could contribute to the nursery too… so special! So cute!!! Hope your little one arrives soon!! Oh I love it all! PERFECT touches. Can't wait to see the newest babe!! 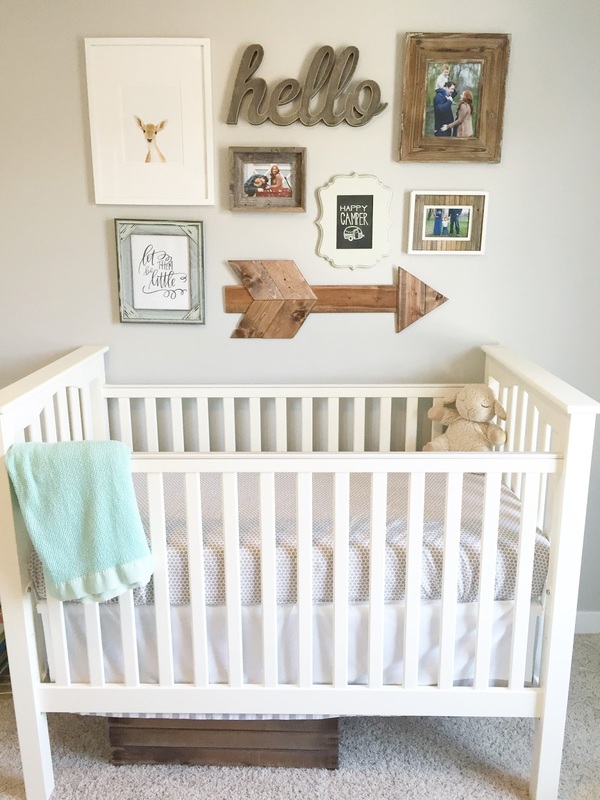 A perfectly sweet little room for a perfectly sweet little baby! Come on baby R! Everyone's excited to meet you! How perfect!! Such a happy space 🙂 Can't wait to hear the great news!!! Love love love! You did an amazing job, Julie! I can't wait for your little bundle to arrive!! Ahh! I absolutely love it!! 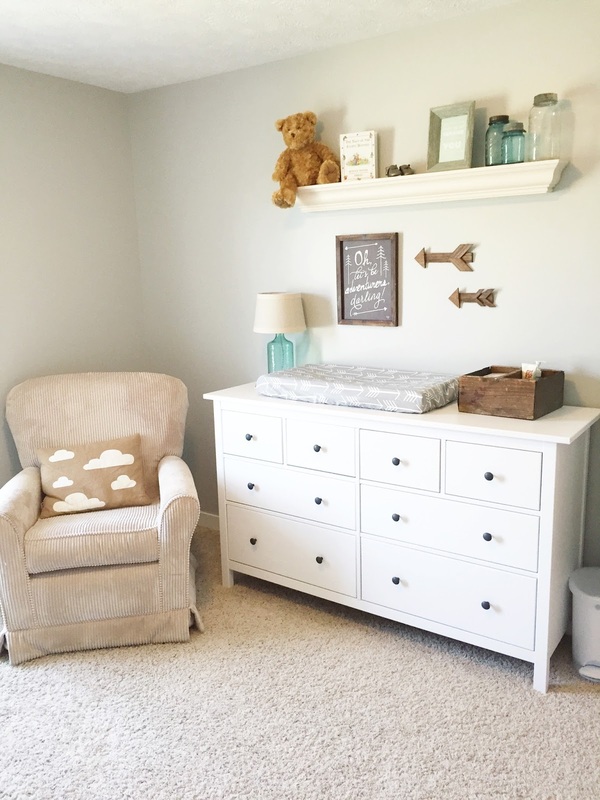 It looks like such a sweet dream of a nursery! You did a great job!!! I'm loving it and all the arrows are so cute! I want some!! Oh this is such a beautiful room! Love it and the story behind "Hello!" Julie, this turned out so great! I love the gallery wall and all the little details, the neutral palette is so gorgeous! I keep checking your Instagram to see if your little one has decided to make his or her arrival – any day now! This room turned out so good! You pulled it all together wonderfully!! And now you can add PINK! AHH!! 🙂 🙂 🙂 So happy for you! It looks fantastic, I love all the details! This is beautiful!! Would love to know the paint color you used on the walls! Love this! 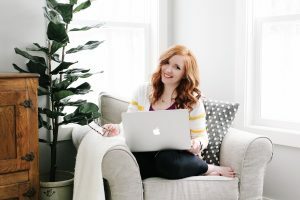 Would you mind if we use your pictures on our instagram and etsy shop? 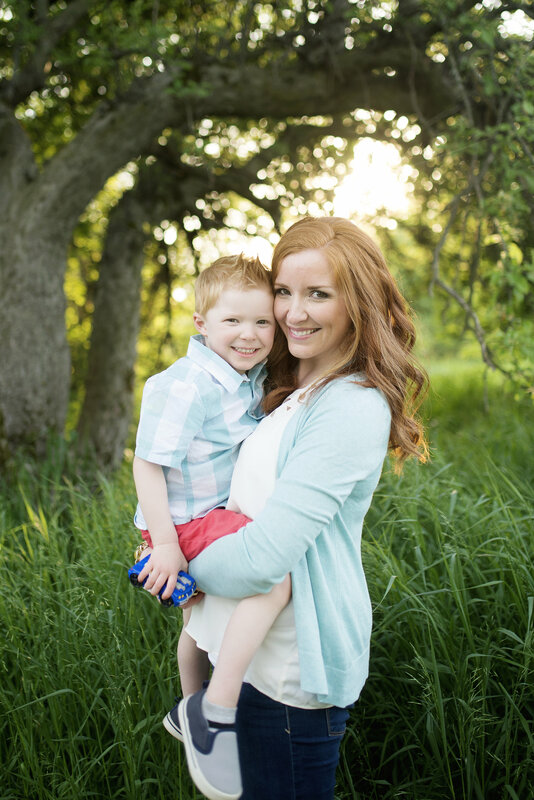 We make and sell items non-DIY moms who see nurseries online and love but can't make. 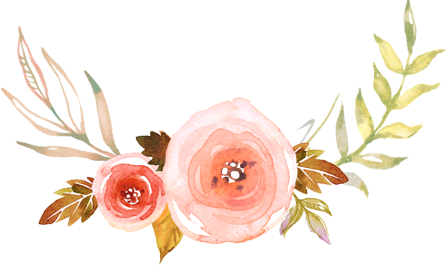 We get thousands of views a week and would give your blog credit and encourage them to visit. Let me know! What color did you end up using for the walls? I've been trying to find a neutral and I'm loving yours! The color is Dolphin Fin by Behr. And I think I have the white stain…it was all that was available. It looks perfect and is super easy to wipe down! Hi, is the ikea dresser the white color or white stain? I'm trying to match to my Pottery Barn simply white as well. Thank you!